Tired of surfing the Crochet Blogs ring just to see if any new sites have been added? Well now you can simply read the Crochet Blogs blog instead. Yay! Check it out. Bonus! The other day I showed you my simpliciTEA pot, which I absolutely love. Well, now I’ve discovered something even more fantastic about it. The infuser basket and teapot lid fit perfectly on a standard coffee mug. Whether this is by design or coincidence, I don’t know, but either way I am in heaven. 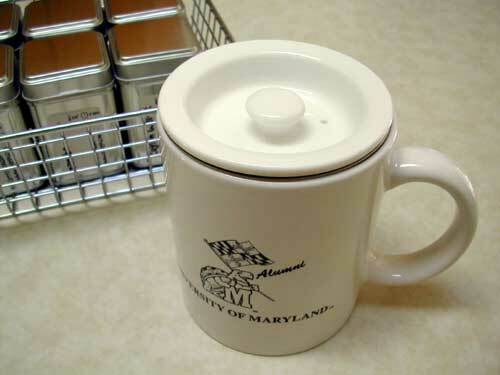 Even though the teapot is small enough for one person, sometimes I really do want only one cup. 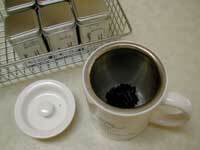 Making one cup in a coffee mug allows the tea leaves to swirl around in the full capacity of the infuser basket. If you tried to make a single cup in the teapot, the water level would not come up high enough in the infuser basket and the tea leaves wouldn’t have enough room to steep. So far I’ve had Ceylon Waltz, Pumpkin Spice, Earl Grey, Golden Needle, and Darjeeling Rhapsody 22. All that’s left to try is Mambo. Earl Grey is my favorite, as it has always been, and I was pleasantly surprised with the Pumpkin Spice. It came as a free sample with my order and I wasn’t sure I’d like it. But the taste is wonderful and much more mild than what you’d think when you open the tin and smell it. donna!! you are killin me!! a crochet bloggers blog — ugh – i’m drowning in the stupid pool of html! Who would have thought other crocheters were tea lovers too? :-) Pumpkin Spice…will have to look that one up, sounds great for this fall.